Pretty solid design for the draft day caps. 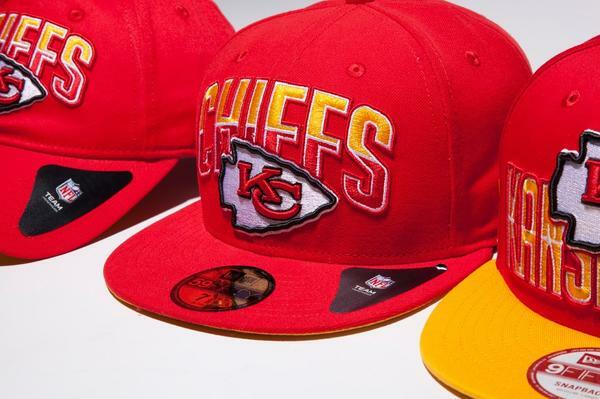 New Era has revealed their new collection for the upcoming NFL Draft. And I must say, from what we see here, it looks pretty nice. Looking at the cap in the middle (which is essentially the same design for the left flex fit cap), we see that the caps will feature the logo and the team name. Last year, it was just the city name covering the logo. What stands out about this cap is the two-tone look for the script. Taking the team’s colors, the script will run across the crown with the logo in the forefront. In my opinion, some teams caps will look really good in this and it still features a vintage type design. The other design that they show is a snapback design. The brim will be the opposite color of the crown, which is the case for most popular snapback designs. Because of that, the script will the same color as the brim and instead of the team name, it will have the city name. The team logo is on the forefront, atop the script. The design is simple and actually a lot better than last year’s design. This for sure will get people excited and purchasing. Aesthetically, these caps aren’t glaring and offensive to the eyes. It’s simple but very powerful. I can’t wait to see the rest of the collection. Hats off to you, New Era. This entry was posted in Fashion, Merchandise, NFL, Uniforms & Design and tagged New Era, NFL Draft 2013. Bookmark the permalink. Have you seen the texans? If not when will they reveil them? No, but it’s the same design template. So you can imagine what it looks like.